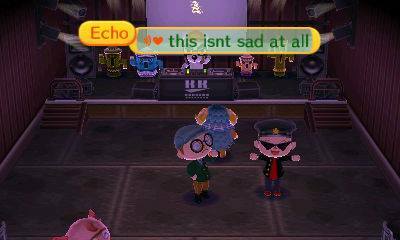 Animal Crossing: New Leaf did some bad things to me. Sure, at first it was all about catching the biggest bug in a friendly competition, netting a fish or two to buy a new shirt, and paying off a small loan that would upgrade my closet-sized starter home into something more akin to, say, a walk-in closet. But then things took a turn for the worse. Before I knew it, I was neck-deep in debt to a family or shady racoons, making questionable bug-trafficking trips to a remote island, wagering my livelihood on an underground produce market and orchestrating vicious pranks against neighbors in the hopes that it would force certain undesirables to pack their bags and move the hell out of my town. I should have known better than to dip my toe into the inviting waters of a new Animal Crossing game. It's the kind of game that lures you into the shallow end with the promise of good-natured fun and wholesome activities. But once you take those first timid steps, you discover that there was a steep drop-off just a few feet in, leaving you to sink way in over your head. The original Animal Crossing for the GameCube hoodwinked my former roommates and I a few years back in a similar fashion. We all thought it was a fun, albeit goofy game at first. Next thing you know, you've got three hungover college students waking up at 7 in the morning on a Saturday to try and purchase the best goods from Nook's convenience store before anyone else can beat them to the punch. We argued over who got to fish in the rain in hopes of catching one of the pricey coelecanth. And then we discovered time travel, creating horrendous time paradoxes that would leave our small town overrun with weeds and our homes infested with cockroaches. I finally picked up a 3DS during the week of E3, downloading the newly launched Animal Crossing: New Leaf that very night. It was a good six days before I finally got to play the game and, when I did, I distinctly remember thinking to myself: This should be a relaxing change of pace. It'll be different this time. We'll take it nice and slow. And it started out that way, too. 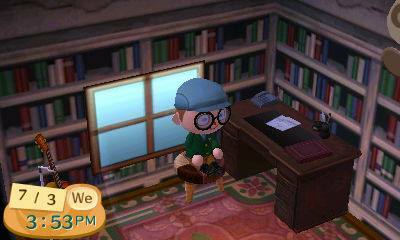 I spent my first day in New Leaf just goofing off. I shook some trees in hopes of grabbing a coin or two. I took part in a cute bug-catching tournament. I paid off a small loan on the promise that my home would receive an upgrade in size the following morning. For a laugh, I even posted a sign reading “CONFORM!” on the town's message board, oblivious to the fact that it was actually a war cry echoing forth from my subconscious. 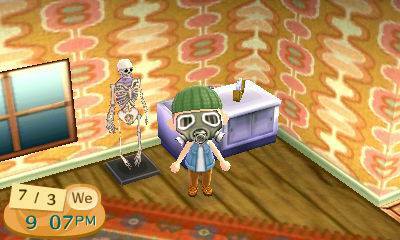 By day two of ACNL, the hooks were already starting to sink in deep. After watering my flowers, shaking my trees and gathering any stray fruit, I took my first real trip down to the shore to get in some fishing. “This is a great way to make money,” I thought, shocked by the thousands of Bells I was raking in following a decent haul from the beach. I paid off my second loan in no time and, the next morning, my home was finally big enough to start having some fun with the decorations. For the next four weeks, things only got worse. I took an ax to any tree that upset what I thought was an optimal path of travel through my town. I began a fishing operation that made the guys on The Deadliest Catch look like a bunch of amateurs. If I didn't earn enough Bells to pay off a house upgrade and a city project every single day, I felt like I wasn't working hard enough. When a neighbor built a house in a place that didn't suit me, I surrounded their home with holes and smacked them with a net until they moved away, terrified of the tyrannical mayor. I even enacted a town ordinance that would allow me to skip watering flowers in order to maximize my ability to get more work done in the hours I was devoting to the game. A few days ago, though, I noticed that the game was turning me into something of a monster. I avoided my townspeople because I hated their stupid faces and their stupid stories that distracted me from my carefully planned daily operations. I no longer found joy in seeing a new project come to fruition because I was too busy planning six projects ahead. The game's processes (buying furniture, turning in fossils to the museum, etc.) became an annoyance because they always seemed to take 10 times longer to accomplish than they had any right to. Once I noticed my patience was growing thin over the silliest of things in my regular day to day life, too, I started to think that maybe I was letting my ridiculous pace within Animal Crossing get to me. By the time I found myself ranting to a friend over the phone as if the game was a significant other that didn't appreciate the time and care I was putting into our relationship, I decided that something had to change. For the past few days I've been playing Animal Crossing: New Leaf at a more laid-back pace. Truthfully, this is the way the game is meant to be played in the first place. It's a marathon, not a sprint, and my gamer-brain was treating it like any other game that had to be “beaten” as quickly as possible. Once I forced myself to take a deep breath, give up the quest for completion and just start taking the activities one at a time, I found I was once again enjoying myself. I'm nowhere near paying off my latest, admittedly ludicrous, home loan. I haven't funded a new construction project in days. I've started talking to my neighbors again. I stopped obsessively shaking every damn tree and watering every damn flower on a mission to make buku bucks or earn that coveted “Perfect Town” label. One of these days may finish up the final expansion on my home. My museum may contain every type of fossil, fish and bug New Leaf has to offer. I might even get around to completing that park I was working on. Whether or not I actually reach any of those destinations, though, at least I'm back to enjoying the ride.